OMG! That doesn't need any words! I have made this recipe many times and it is always met with rave reviews. If you like a lot of sauce, though, you should double the recipe to ensure you don't come up short. That is my favorite spaghetti and meatballs recipe (I usually double or triple the sauce). Delicious! The title is right - wordless wednesdays. No words to describe how much I love this dish. nice, no words needed on this one! Meatballs and Spaghetti are an all time favorite of mine. Love the photo. This is kind of making me regret the lox we had for dinner. :) Looks lovely. Nice meatballs my bf is Italian Spaghetti is his favorite maybe next time I can try this one later. wow that looks amazing! aww wish i could have a bowl of it for dinner tonight. I LUUUUV this recipe. It is hands down the best meatball recipe I've ever come across! Been making it since I first saw the recipe online... maybe 2 years ago? Everyone loves it. Awwwww that looks so delicious, so temptingly delicious. But it's fully packed of carbohydrates. I think I'm going to eat one today and not eat for the rest of the year! 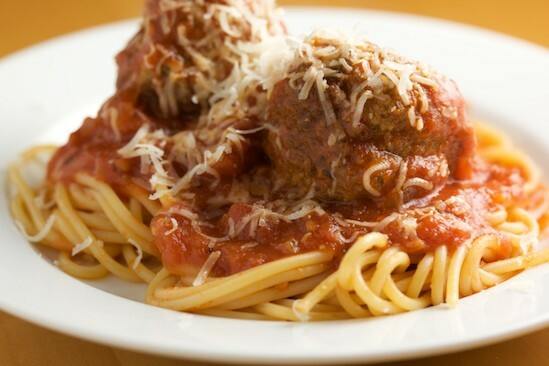 Spaghetti and Meatballs were definitely a staple for dinner growing up. I don't have it nearly as much as I should anymore! Thanks for reminding me!